Printed stuff about, with and from 2CVs. The advertising brocures reflect the spirit of the period from 1948 to 1990 in wonderful colors. The rollerblades had four wheels like a car and somewhen Citroën Germany called the 2CV "Duck" like all other Germans did, too. Thans to Siegfried, who gave me his archive filled with almost all the stuff presented at this chapter. 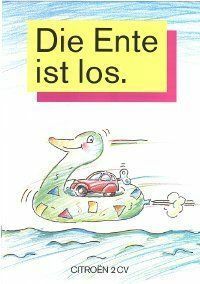 The whole story about the sales promotion in Germany is available as a CD-ROM "Viola Monpti", created by Jan Eggermann and Ingo Meier, published by " Garage 2CV". Have a look at the pages of Amazon. 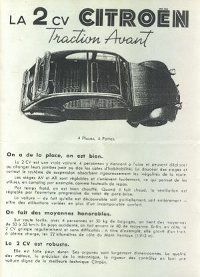 Automobiles Citroën, Frankreich owns the copyright of the drawings presented at this column. 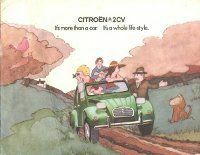 I got the permission to publish the drawings for non commercial use from the Citroën Deutschland GmbH. Many thanks! Please consider the copyright!